Sailing to and from the same port of call is a great advantage to me. This time from beautiful and cosmopolitan Buenos Aires is a plus to this cruise. I live there! The celebrity Eclipse is a luxury ship with plenty is amenities for all tastes: fitness center spacious with many elements and sea view from all corners, live music all the day long in different locations, matinee shows on sea days and evening shows every night with international artists, indoor and outdoor pools and whirl pools, spa and Lersian garden to relax. Food is fantastic in all restaurants, main one Moonlight Sonata is huge. We had access to Blu the exclusive restaurant for Aqua Class passengers which was cozy and well attended by Nelly and all Blu staff. Buy sailing along Paradise Bay in Antarctica is the most fantastic experience I have had in my entire life! Put it in your bucket list!! The views are outstanding with a few huge whales and tiny penguins swimming along the ship. 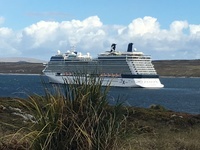 Ports of call are also worth visiting Ushuaia southern most city in the world, Falkland/Malvinas Islands, Puerto Madryn , Montevideo and Buenos Aires. Each has it beauty and charm. Sailing to and from the same port of call is a great advantage to me. This time from beautiful and cosmopolitan Buenos Aires is a plus to this cruise. I live there! 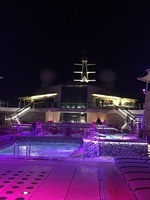 The celebrity Eclipse is a luxury ship with plenty is amenities for all tastes: fitness center spacious with many elements and sea view from all corners, live music all the day long in different locations, matinee shows on sea days and evening shows every night with international artists, indoor and outdoor pools and whirl pools, spa and Lersian garden to relax. Food is fantastic in all restaurants, main one Moonlight Sonata is huge. We had access to Blu the exclusive restaurant for Aqua Class passengers which was cozy and well attended by Nelly and all Blu staff. Buy sailing along Paradise Bay in Antarctica is the most fantastic experience I have had in my entire life! Put it in your bucket list!! The views are outstanding with a few huge whales and tiny penguins swimming along the ship. Ports of call are also worth visiting Ushuaia southern most city in the world, Falkland/Malvinas Islands, Puerto Madryn , Montevideo and Buenos Aires. Each has it beauty and charm. Spacious and comfortable cabin with a large bathroom and veranda with deck chairs and a table. Very clean and tidy. Large bed plenty of pillows. I strongly recommend it. Great day in the National Park. Lake sea and land views at the same time.